So, you have done the right things and switched out all our lightbulbs for compact fluorescent lamp (CFL). You are saving energy, money and reducing global warming. How you may ask, here is were to start. Earth911.org (or call 1-800-CLEAN-UP for an automated hotline): Online, enter your zip code, press “GO,” click “Household Hazardous Waste”, then “fluorescent light bulb disposal.” The site will identify your nearest residential mercury recycling facility or mail disposal method. Call your local government if the Web site and Hotline number above does not have your local information. Look on the Internet or in the phone book for your local or municipal government entity responsible for waste collection or household hazardous waste. Since CFLs use about 1/4 of the energy of incandescent bulbs they are a key part of efforts to fight pollution. 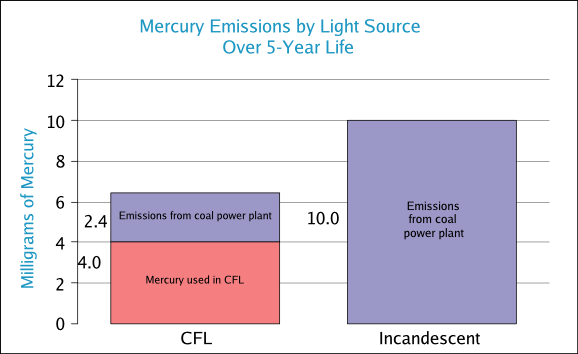 Mercury use of compact fluorescent bulb vs. incandescent bulb when powered by electricity generated from coal. However, CFLs contain trace amounts of mercury. The amount is not large enough to pose a hazard to users, but it does become a concern at landfills and trash incinerators where the mercury from many bulbs can escape and contribute to air and water pollution. The first step of processing involves crushing the bulbs in a machine that uses negative pressure ventilation and a mercury-absorbing filter or cold trap to contain and treat the contaminated gases. Many municipalities are purchasing such machines. The crushed glass and metal is stored in drums, ready for shipping to recycling factories. Note that coal power plants are the single largest source of mercury emissions into the environment. 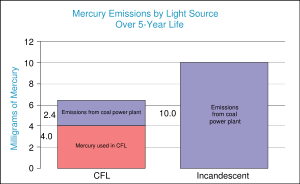 According to the Environmental Protection Agency (EPA), (when coal power is used) the mercury released from powering an incandescent bulb for five years exceeds the sum of the mercury released by powering a comparably luminous CFL for the same period and the mercury contained in the lamp. Looks like there needs to be more work done in this area as the closest location to me is by Chicago! The best site is the earth911.org site. Thanks, Christopher.